Australian scientists are trying to save a unique marine species called the Weedy Sea Dragon. There are worries the creatures are now endangered. But to confirm that, researchers need help from citizen scientists and some amazing facial recognition software. They are now trying to take a picture of every weedy sea dragon they see so instead of catching every single one of them, they can use recognition from the photos because they each have special features that make them all different. Scientists say you would be lucky if you went diving in Sydney or the great barrier reef and find one. Sometimes diver go to find them only to find nothing. No dragons camouflaged or anything. Why do these animals camouflage? Weedy sea dragons are classified as ‘near threatened’, but scientists reckon this research could provide enough info to have them re-listed as ‘endangered’. They reckon climate change could be a big part of the problem for the sea dragons. They say rising sea temperatures are killing the kelp which leaves them homeless. Something strange about the recognition of these magnificent creatures is that the scientists give them names like David, Greg or Alicia. Why do the scientists give them names like that? I learnt that a lot of animals are nearly extinct and we havn’t been paying attention to them. I felt scared, worried, frightened. I had 3 fears. Clowns, spiders and storms. I hate storms. Just the way the lightning lights up the sky. The way the thunder hurts my ears. Some people enjoy storms because they produce rain for their dry, awful gardens. I’m not obsessed with my garden so I shouldn’t like storms. To make matters worse I feel like there are ghosts in my room. In the flash of lighting I saw a strange figure. By the time I started to study it it disappeared. A few years ago BTN reported on a disease that was threatening the future of the Tasmanian devil. Since then zoos have been hard at work on special breeding programs trying to make sure the Tassie devils don’t die out. It’s a slow process but it’s getting some great results. The disease is a face tumour and it happens when Tassie devils bite each other. It doesn’t stop the animal from breathing but it stops it eating. After they are diagnosed with the tumour they have about 6 or 7 months until they must face the consequences. Death. But scientists and zoo keepers are looking to stop that from happening. If they can the Tassie devils will be of the endangered animals list. Out of ten Tassie devils haw many would have a face tumour? Usually the mother gives birth to about 30 children but she can only feed 14. The others will die because of lack of food. That is why there are not many Tasmanian devils in the world. The devils in zoos live longer then the ones in the wild. We don’t think of Tassie devils as a poor, endangered animal. We think of it as a demon. Something that scares people easily but that’s not what it is at all. Why does the mother only have enough food and milk for 14 of her young? I now know how important it is to pay attention to any animal in the world because they might just be endangered. “Here you are,” said the waitress handing over a scrumptious burger with fries. It almost looked too good to eat. Almost. I took a quick picture of it first and then started to dig in. This restaurant had BAD reviews. I couldn’t believe it. I peered over to the exit and there were police officers there. I could hear people complaining about their food being stolen. I turned back to my burger. It had vanished. 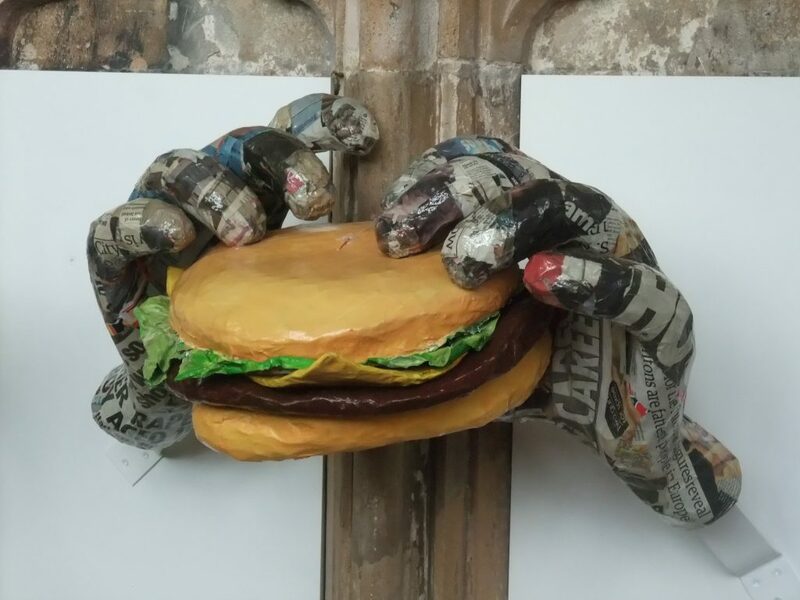 All could see were two hands in the wall holding a burger… my burger. The mystery was solved, but not over. Our focus this term is animal adaptations. We went to the aquarium to study the way the underwater animals survive. We saw lots of animals like crocodiles, sea-dragons, cuttlefish, penguins and lots of fish. My favourite was the penguin. I love the way how it was playful but was great at surviving extreme weather. The features it used to survive was waterproof feathers. When they swim the water won’t affect their feathers and won’t make them drown. The baby penguins are not allowed to swim until their grown up feathers grow because baby penguins are fluffy and their feathers will make them sink to the ground. 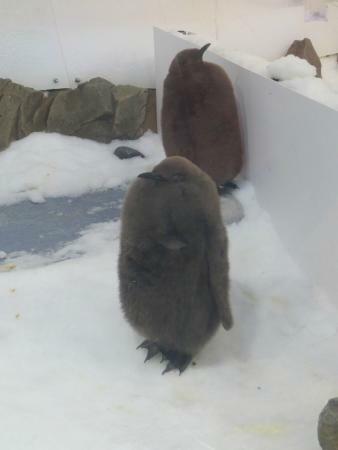 There were two types of penguins at the aquarium. The king penguin and the Gentoo penguin. Their webbed feet help them to survive because it makes it easier to walk so it won’t slip down on the ice. This video was about Australians and their clothes. Australians love buying new clothes, but the latest trends might not always last long in your wardrobe. Those clothes can take decades to break down in landfill. So now some environmental groups say we should be buying better quality clothes and committing to them for longer. Why do people always want to wear the latest trends? This video explained why Australians buy so many clothes. It said that each Australian buys at least 27k every year!!! It said that we should try re-use them instead of throwing them away. When you throw away your clothes do think of people who can’t afford clothes or how long people spent making them. In the olden days people had very few clothes and if they broke they would usually get the women to sew them back together. I now understand the importance of not throwing out your clothes and why that helps the environment. BTN- Why do we sleep? A lot of people ask why we sleep. Some of them have had an answer. Some have not. The reason we sleep is so we don’t exhaust ourselves. We need sleep like we need nutritious food and water. Dolphins have found a clever way to sleep and still survive as they need to breathe out of the water but ,still stay in water and not come to shore. Their discovery is to sleep with only half of their brain at a time. That way their brain can tell them to go out of the water at certain times. Unfortunately, humans can’t be like dolphins, so there really is no clear answer why we sleep. How do dolphins keep their brain awake? There are some facts we do know though about sleep. A lot of people thought that sleep was something where our bodies aren’t doing anything, almost like we were unconscious during the night, but now we know that there’s a lot that our brain does when we’re asleep and it’s really busy working through a lot of things so that we’re prepared for the next day. So there’s a lot that we take in during the day when we’re at school we’re learning different things, we’re seeing different things so during the night one theory is that our brain is sorting through all of that information and going through and working out what’s important and then it stores that information as memories and when we wake up we can remember what we’ve learnt the day before. It has been proven that if we don’t get enough sleep our brain struggles the next day. If we get a good nights sleep then we will be ready for the day and will easily take in information. Why does sleep effect our next day? I now understand the importance of sleep and why we do it.